X Factor phenomenon and national treasures Jedward have today signed with Sony Music and will release their debut single later this month. 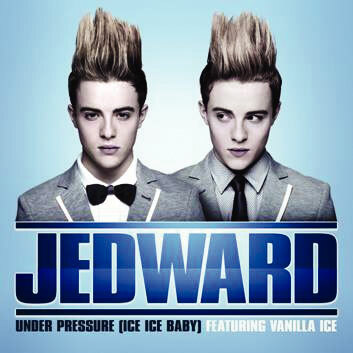 Jedward featuring Vanilla Ice "Under Pressure (Ice Ice Baby)" Is at no.2 in the Irish Charts this week. Finally bowing to public demand Jedward's first single will be Under Pressure (Ice Ice Baby), featuring 90s icon Vanilla Ice. The duo, who caused a national sensation with their gravity defying quiffs and energetic performances on last year's X Factor exclusively performed the single, along with Vanilla Ice, at The National Television Awards on 20th January. The single is available to download now with a CD release in shops today Friday February 12th. "Ice Ice Baby", which samples the bassline of the Queen/Bowie classic ‘Under Pressure,' was originally written by Vanilla Ice and DJ Earthquake; hitting No.1 across the world. The success of the single led Ice's album ‘To the Extreme' to sell over 15 million copies, making it one of the most successful selling rap records of all time. John and Edward said of the single: "A year ago we were training for cross country competitions and now like our idols we are living our dream. We really can't believe that we have a single out and are performing with Vanilla Ice. We're dedicating this single to all our fans who have been so supportive to us throughout The X Factor."